When taking a stroll down the aisle all the bride has to worry about is putting one foot in front of the other. But when it comes to the attendants, some order must be taken to avoid chaos. There are a few of different methods to set up the couples, and for some people, there are also superstitions that guide the decisions. First, is the somewhat traditional choice of pairing your bridesmaids and groomsmen by height. This offers structure, looks appropriate for pictures and evens out each side. This option comes into effect when the ages of your attendants vary. Your 14-year-old niece or daughter will pair oddly with a grown adult, and so on. Match each pair a little closer in age to avoid any clutching of pearls by some guests in attendance. More of a Southern tradition, the order of your bridal party goes in the order of closeness to the couple. The maid of honor and best man, closest of all, walk last. Attendants who have closer relationships with the couple go after the maid of honor and best man. The farthest away in family or friendship (this could mean a newer friend, for example) walk first. This particular way of lining up your attendants started a large discussion in the “Let Them Eat Cake” thinktank. Typically, if a couple is married, it would make sense for them to walk together as bridesmaid and groomsmen. 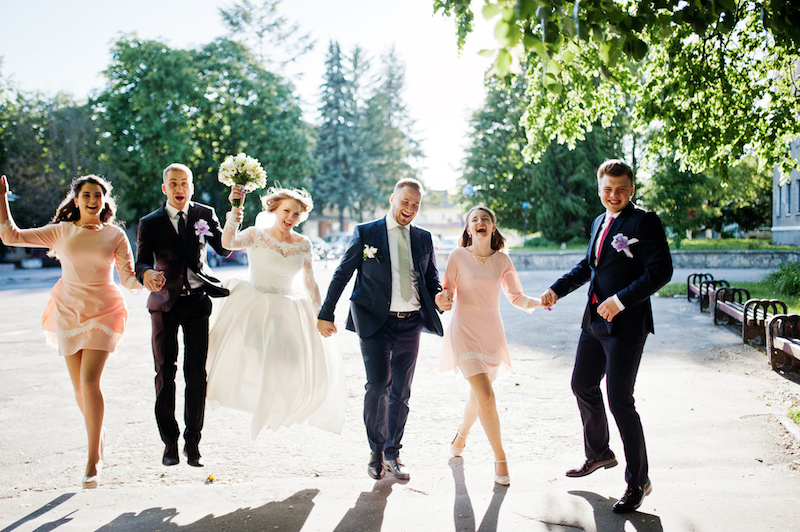 It’s easier for the bride and groom to pair married couples and may look off if they do not walk together. You can also pair any brothers and sisters together, or other family members as well. However, another bit of lore tied to this topic has been brought to our attention. Kelly here: For years, I have been under the impression that there is a myth or a superstition that a couple that is dating or engaged, but not married, cannot walk down an aisle together as attendants or it will be bad luck for their relationship. I put a call out on social media to crowd source where I may have gotten this superstition, but we still can’t figure it out. The closest Melanie and I can get is that there were many people who responded on social media that said it was an Italian tradition. Let us know in the comments if you have heard this superstition and what you think about pairing unmarried couples together as attendants.